Best 24" IPS Monitors of 2019: Reviewed and Rated - Digmodo: Gadget reviews and ratings for discerning consumers. Test Methodology: Three DigModo experts in computer hardware put the 13 monitors to the test. We connected them via DVI, DisplayPort, and HDMI (as available) to two test rigs. First, an Asus ROG G Republic of Gamers laptop, and second a CUK MSI Nightblade MI2 running a GTX1060 GPU. We did several standard benchmarking tests, including color realism, color gamut, brightness, refresh rate, ghosting, tearing, and checked for malfunctioning pixels. We also did several subjective tests by performing gaming and office productivity tasks, testing out the present modes (like gaming, movie), and evaluating the ergonomics. We also scoured online reviews from over 6 websites to get a more informed opinion about the broader community using each monitor, to make sure that we represented reliability anomalies being found among consumers. Test Requirements: Every monitor reviewed and recommended below meets minimum performance requirements: 1920 x 1080 resolution, multiple input connectivity options, maximum of 8ms response time, and a price point under $300. Energy Star certification was a plus, but only found in a few of the options (the HP and AOC). We want to note that all of the monitors on our top 5 list are excellent options and you can't really go wrong with any of them; just be sure to read the pros and cons of each, and make the best decision for your particular circumstances and needs. 1. Dell UltraSharp U2417HJ 23.8" LED-LCD IPS Monitor. If you value what IPS technology offers in terms of bold and highly realistic colors with a wide viewing angle, this Dell UltraSharp is a great choice. 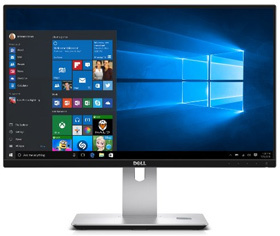 Over the years, we've reviewed over a dozen UltraSharp monitors, and we have always been impressed with Dell's ability to produce high color quality at reasonable prices, and overall the UltraSharp reliability is generally quite good. We had the U2414H at the #2 spot last year, and this one is a great step up. So we were happy to be testing another UltraSharp this year, and were interested in seeing how it compared to the competition. While this monitor is a bit slow for gamers with its 5ms response time, it truly excels with image editing and video. It has a widescreen (16:9 ratio) panel with a 96% sRGB space with 16.77 million colors (turn on the sRGB mode), and an impressive ~178-degree viewing angle. And don't let the 8ms response time fool you, it's plenty fast for anything but a real gaming fanatic; the 60Hz refresh rate (which we confirmed with our oscilloscope) is competitive with some of the best LED-LCD monitors out there. Our test unit arrived without any malfunctioning pixels. The functionality and styling of this monitor are really impressive. It offers VESA compatibility (100mm), two HDMI inputs (plus DisplayPort and miniDisplayPort), vertical and tilt adjustment, and can be rotated and used in portrait mode. In terms of styling, it has an extremely thin border which is great for creating (somewhat) seamless dual or triple monitor setups, a nice anti-glare coating, and the upper black contrasts nice with the silver base stand. So what differs from last year's version? Well, this monitor integrates a nifty wireless (Qi or PMA) charging platform on the base. So just set your compatible mobile device down while you're at work and it will wirelessly charge. Our reviewers loved this feature, and thought that more monitors should take advantage of that otherwise dead space down on the stand. If you're not going to use the wireless charging feature and want to save about $50, definitely check out last year's model here. And of course if you're not fond of the widescreen aspect ratio, they make a traditional ratio (16:10) version that you can see here. Downfalls? Not many, but just in case your system has some connectivity limitations, there is no VGA or DVI input, and there are also no onboard speakers. Also, as with all IPS monitors, you will see a bit of a glow around the edges (light bleed), especially in dark rooms. This is completely normal for IPS monitors, and the viewing angle and color reproduction advantages make it entirely worth it. You can find this UltraSharp monitor here for about $199. 2. 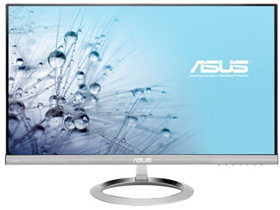 ASUS MX259H 25" LED-LCD IPS Monitor. This is the third year in a row that an ASUS monitor has made it into one of our Top 5 monitor reviews, and for good reason. Before we get into the details, we want to note that ASUS makes a 23", 25", and 27" version of this monitor. We realize that this isn't strictly a 24" monitor, but you are getting a huge bang for the buck with the 25" version, and we think you might as well bump up to 25" for the extra $20 relative to the 23" version. That being said, this "frameless" monitor was a huge hit with our reviewers, and has some truly excellent specifications, features, and reliability. First some of the basics: this IPS LED display has an awesome 178-degree viewing angle, a fast 5ms response time, a very thin "edgeless" bezel, and fantastic color reproduction. With a contrast ratio around 1000:1, a 60Hz refresh rate, and a ghosting time around 10ms, this is not a gaming monitor, though it is suitable for videos and very mild gaming. If you want a gaming monitor, check out our list of those here. The color reproduction and realism were fantastic, even at extreme viewing angles, and even during video playback. The form factor is phenomenal. Very sleek (about 2cm thick), a very thin bezel along the left and right edges (about 1cm), and some basic tilt adjustment (not there is no height or rotate adjustment). But that thin panel comes at a cost: there is an external power supply about the size of a laptop charger that takes up a bit of space (under the desk, of course). They squeezed two HDMI inputs, one VGA input, and a headphone and audio input jack onto the back panel. ASUS incorporates a few features that are very useful. First, we thought the dynamic backlight adjustment was really useful for reducing perceived flicker and eye strain. Second, the blue light filter was useful, especially when using in the dark or closer to bedtime. Also, it's rare to say about a monitor, but the built-in speakers were actually really impressive. First, there is no DVI input, though they do include a male DVI to HDMI adapter to help you out, which is a nice touch. Second, there is no DisplayPort input, which some people might find very limiting. Finally, you need to buy an adapter to make this monitor VESA-compatible. Overall, this is a highly recommended monitor with only a few drawbacks that some people might find limiting. You can find this ASUS monitor here for under $199. 3. ViewSonic VX2478-SMHD 24" IPS Monitor. 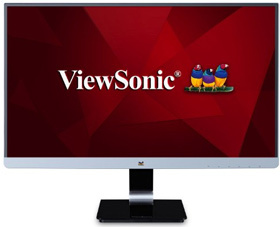 ViewSonic has been in the monitor game for many years now, and they really know what they're doing when it comes to producing a high quality, high performance monitor. The only downside is that you'll pay a big more for some great specifications, and that increased cost may or may not be worthwhile for your specific use cases. This particular unit tends to be just under about $275. So let's get into what that extra cash buys you. While the other monitors on this list use HD 1920x1080 resolution, this particular display uses what's called Wide Quad HD (WQHD), which increases the resolution to 2560x1440. You'll want to make sure your computer's graphics card and drivers are capable of supporting the higher resolution. Speaking of connecting to a computer, this monitor comes with several connectivity options. We appreciated that it included the typical HDMI, but also DisplayPort and VGA options. The IPS panel on this monitor is outstanding, at the level of the Dell UltraSharp, with excellent color gamut and reproduction/realism. In our tests, it came out on top with the Dell for color rendering, and the crisp colors and contrast looked even better with the WQ high resolution. The form factor was also great, similar to the other slim-line and tiny-bezel options on this list, though the back did have a box that protruded a bit more than the others. We thought maybe this was to support a standard AWG universal plug, but no such luck, the power connects with an external brick just like the others. Another advantage is that it's VESA compatible, making it easier to configure multiple monitors, particularly since the included stand is very limited (only front/back tilt adjustment). So you're getting more versatile connectivity, VESA compatibility, WQHD resolution, integrated speakers (which were decent), and a great form factor. Worth the increased cost, coming in at around $275? That depends on your circumstances. If you value VESA and need the increased screen real estate offered by the WQHD, then it's likely a worthwhile investment. 4. HP 24EA 23.8" HD IPS Monitor. If you're looking at the ASUS and HP and wondering why they look so similar, we suspect you're on to something. Though we didn't dismantle and read the panel codes, either these are the same monitors with different casings and branding, or they are getting very close to infringing on each other's designs. We'll leave that up to the lawyers to figure out. Though we will note that the HP comes in a 24" format, which the AOC does not, though they do both also come in a 23", 25", and 27" version (see them here). We apologize in advance for this review being so similar to the AOC review. Our reviewers really enjoyed this monitor, and had high praise for its color reproduction, thin form factor, high contrast ratio, anti-glare panel, and great IPS viewing angles. Like the AOC, this display showed a fast response time, a 60Hz refresh rate, and ghosting time of around 10ms. Not a gaming monitor, but it has good brightness (around 250 nits), and some excellent color reproduction, even at viewing angles of about 120-140-degrees. And if you're thinking about the power consumption with all that brightness and color rendering, this monitor is Energy Star certified. The form factor is identical to the AOC, with a super thin frame and bezel, built in rear speakers (that sounded pretty good), and a forward/back tilt built in to the stand. No height or rotate adjustment, and no VESA mounting without an adapter. Personally, we think the whole VESA thing is odd: if you're making such a thin bezel panel, presumably you're also anticipating multi-monitor setups. But without the VESA mount, this becomes very difficult unless they're just sitting side-by-side on a desk. Which is also unlikely given they are not height adjustable, and in 2018 we think it's time to move beyond stacking up a pile of textbooks to support your monitors. Connectivity is a bit more limited than the AOC, with only a single HDMI and VGA input, and an audio in and headphone jack. So all the limitations are the same as the AOC, but a bit more with the HP given the connectivity. 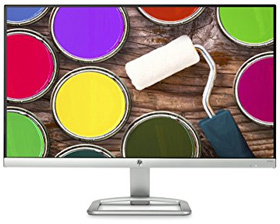 However, we also want to note that this monitor is probably the biggest bang for the buck on our list, coming in usually under about $140 which is cheap for any IPS display, but definitely a great price given the high capabilities of this monitor. 5. 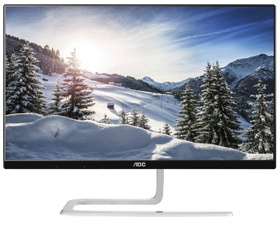 AOC i2481FXH 24" HD IPS Monitor. We like to think of AOC as the Hyundai of the computer monitor industry. They make decent products for lower prices than the big brands, but sometimes you get what you pay (less) for. This computer monitor is no exception, though were were very impressed with its overall specifications, features, and performance. Let's start with the positives. Just like many of the monitors on this list, the AOC is taking on the super slim form factor, with a very thin chassis and super slim bezels. This is great not just for visual appeal, but it also saves a bunch of desk space, especially if you're considering a multi-monitor setup with minimal bezel space separating the panels. The technical specs are great: 1080 HD, 5ms response time, 20 million to 1 dynamic contrast ratio, a 178-degree IPS viewing angle, highly accurate (in our tests) 8-bit color depth, 250 nits brightness, and a 60Hz refresh rate (confirmed with our oscilloscope). In our use, the reviewers commented that the color reproduction was just as good as the AOC and HP models, as was the viewing angle, and ghosting and tearing. They found image and video editing to be high fidelity and easily managed on this unit, though they did comment that the blue light was a bit intense. And if you're thinking about the power consumption with all that brightness and color rendering, this monitor is Energy Star certified. With video games, we did see some ghosting and tearing, which is to be expected with an IPS display. So overall, there are some excellent specs here, and our reviewers though it was better than many others in our test. For cons, we have a few addition things worth pointing out. First, our display came slightly tilted to the left and we ended up basically having to bend the stand to get it to straighten out. There were also no built in speakers, which is a big negative compared to others on this list. Finally, there is no VESA mount compatibility, and no DVI or DisplayPort inputs. So some big limitations from a display that has otherwise excellent performance, and can be found for an excellent price around $150.